My goal before the NE Proto Meet next year is to finish everything from the rail down. This will include some items above the rail (like the water column you see, which needs a little modification), but it will basically be all of the infrastructure that's needed. I don't know if I'll get to many buildings by then. So I continue to slowly move along with the groundcover. I made some more progress last night, and it appears that the sections I did (including fixing the areas that had turned white) are working OK. For this section it would appear that moving slowly is the best approach, and using as little glue as possible (in this case Pledge Floor Care Finish, formerly known as Future). In the past I've done the usual 'flood the ballast' approach without any issues except on my layout. The AC is keeping the humidity down at home, so I don't think that's the issue. As I glue down the foam in other areas of the layout I'll use wood glue instead of a water soluble glue and maybe that will help. The basic process is relatively simple. The track was spray painted with Rustoleum camouflage in place. I don't bother protecting the railheads or turnouts. I just use a brightboy to clean it once the paint has dried. I haven't had any issues with the turnouts that a little cleaning with a scalpel, dental pick, or file doesn't fix. 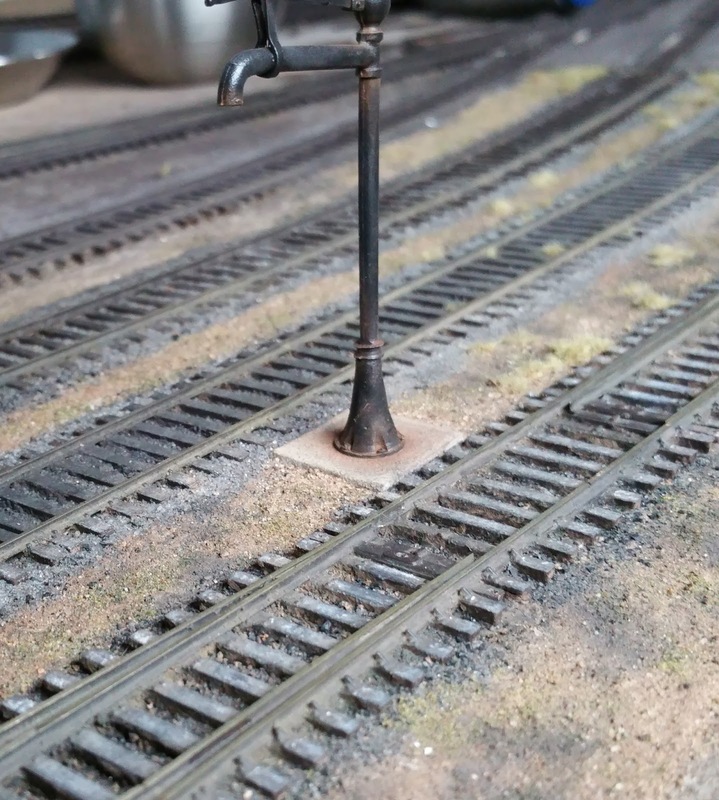 The ballast is a mix of Scenic Express light limestone mixed with a little charcoal grout to make it a little darker. I sprinkle that and some real dirt using my fingers for placement. 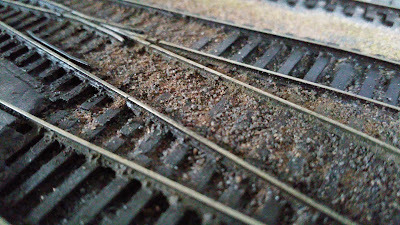 I follow John Nehrich's recommendation for a well defined ballast line, although instead of masking with tape (which I think leaves a bit too much of a recognizable edge), I just use a piece of cardboard as a mask, held just a little bit off of the layout to give a defined, but slightly 'fuzzy' edge. I also sprinkle on a little Woodland Scenics fine ground foam for a little variation. Weathering is Pan Pastels and charcoal grout. I use a little of a very light gray on the ties first, for that sort of silvery weathered look, but then use a bit of burnt umber to tone it down a little more, In addition, photos of the era show more of a brownish cast than the old weathered look. Between the rails I'm using charcoal grout. 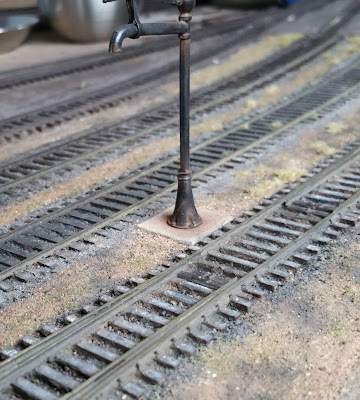 I will also use some black, and maybe some other medium to do oil stains between the rails. I'm really happy with the results so far, so I'll keep working through the occasional white glue incidents. It's annoying, but hopefully I'll only have to deal with it once. Well, twice since I've already taken everything out once!